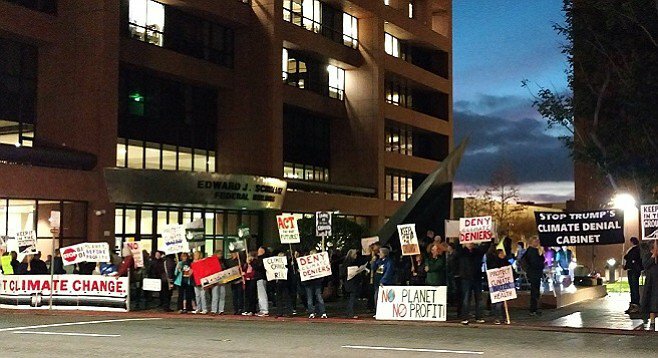 San Diego, CA – On the grassroots climate advocacy group SanDiego350 is urging President Trump to keep the U.S. a signatory to the international Paris Climate Agreement, in which most of the world’s nations united to reduce carbon emissions. The group, which last month brought together over 5,000 San Diegans for the People’s Climate March at Waterfront Park, says that pulling out of the Paris Agreement would set back global climate leadership and condemn Americans to increasingly devastating climate impacts, poorer health outcomes, and loss of jobs and prosperity. “The Paris Agreement is the backbone of international action to tackle the greatest challenge facing our civilization: climate change,” said Bill Wellhouse, a member of SanDiego350’s Steering Committee. He added that the world’s nations had acknowledged that climate change affects the poor, communities of color, and Indigenous people first and worst. Scientists have estimated that 80% of known fossil fuel deposits would need to remain in the ground in order to meet the Agreement’s target of keeping the earth’s temperature to less than 2 degrees Celsius above pre-industrial temperatures. This week the U.S.’s G7 allies urged the President to remain a party to the agreement, which nearly 150 nations are party to, and which even big business strongly supports – including household names like Microsoft, Starbucks, and Gap, as well as major oil firms like Exxon and Chevron. The group, which rallied against Trump’s climate-denying cabinet nominees in January said they plan to organize a protest later this week should President Trump decide to pull out of Paris.